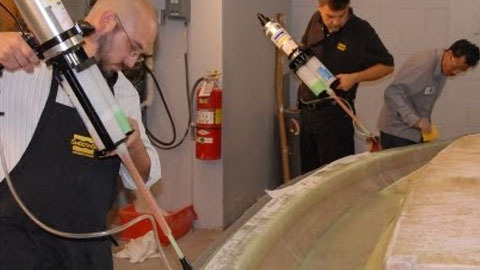 EZ~Spray®, The Easiest Way To Spray Moldmaking and Coating Materials | Smooth-On, Inc.
Smooth-On's versatile line of sprayable rubbers, plastics and foams are for large projects or for completing a number of smaller projects simultaneously. 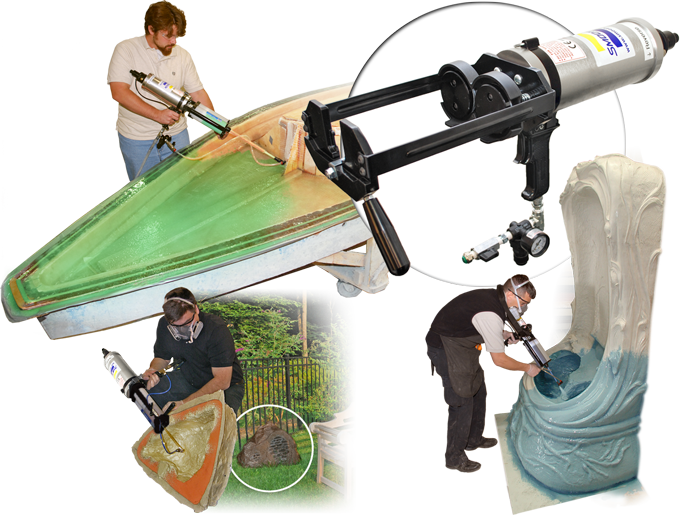 The EZ~Spray® Jr. spray system is an inexpensive alternative to buying complicated spray equipment that can cost $25,000 and more. 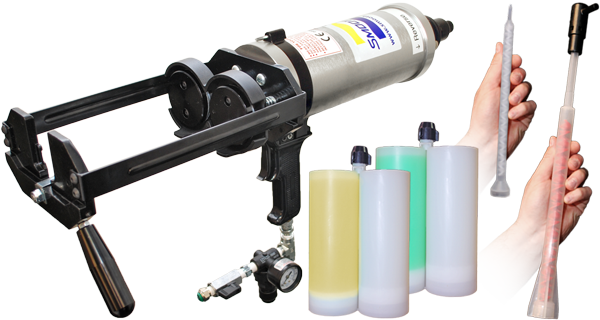 The EZ~Spray® Jr. spray gun is portable, easy to use and can deliver all of Smooth-On's sprayable materials. 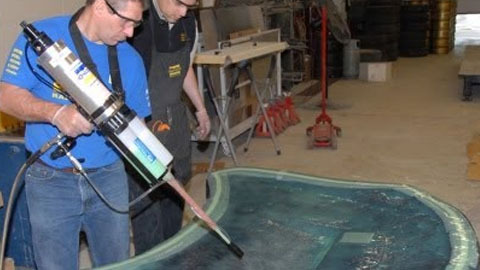 The EZ~Spray® Jr. gun is a versatile, convenient and easy-to-use spray system for spraying 1500 ml cartridges of EZ~Spray® coating, mold making and casting materials for large projects. 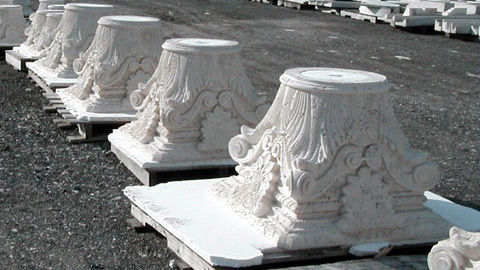 Save time & labor costs over hand-application methods with virtually no cleaning or maintenance to operate. Compressor not included. 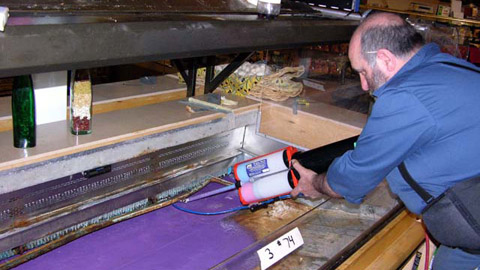 Effective for making reusable Cost-Effective vacuum bags fast for producing composite parts vs. consumable bags. 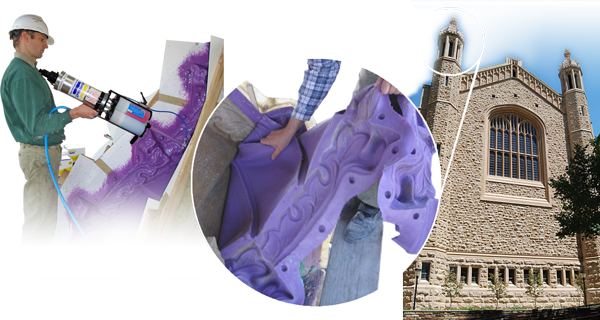 Eliminate Waste and Reuse with different resins and fabrics. Newly fabricated vacuum bags can be removed from the tool assembly in a matter of minutes and be put into production service immediately. 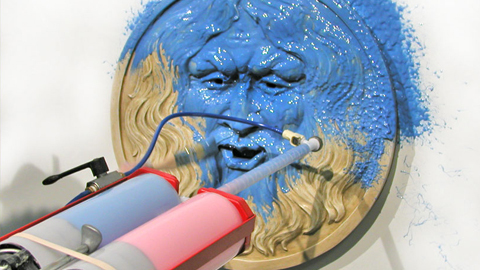 EZ~Spray® 35 Platinum Silicone Rubber can be sprayed onto vertical surfaces with minimal surface preparation, for making fast rubber molds of large surface areas. 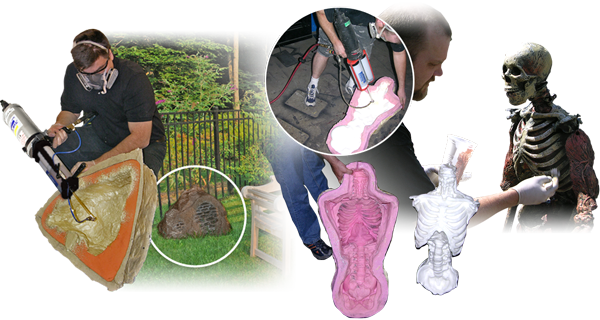 EZ~Spray® 45 cures overnight with negligible shrinkage to a durable mold rubber. 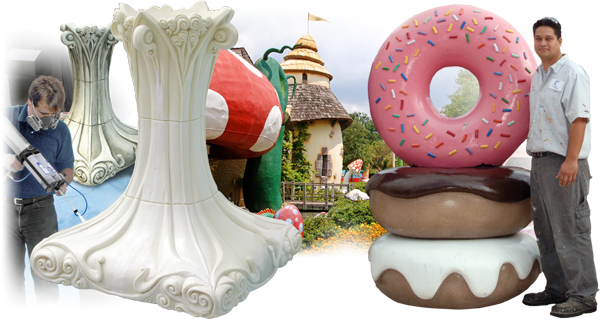 Application of a support shell is achieved by spraying Smooth-On’s EZ~Spray® Plastic over the rubber mold after it has fully cured. 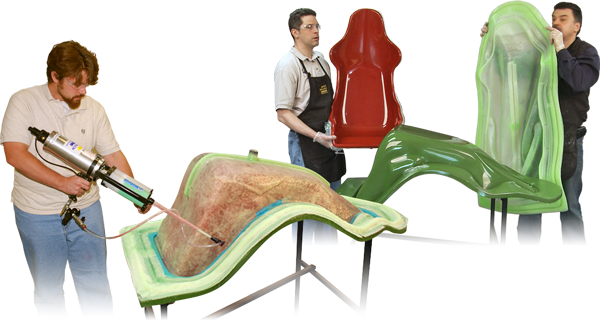 EZ~Spray® plastic can also be sprayed or meter mixed into rubber molds as a fast setting casting resin. 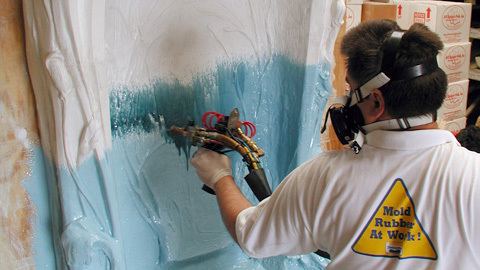 Flame Rated EZ~Spray® StyroCoat® plastic is formulated to coat foam economically and cures in about 2 seconds. 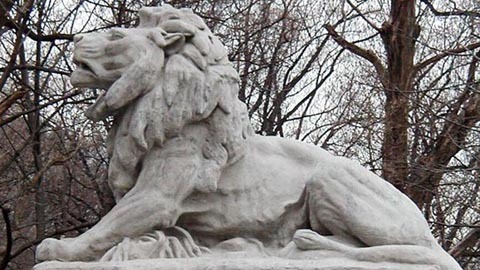 StyroCoat® can be applied to vertical surfaces without running off. 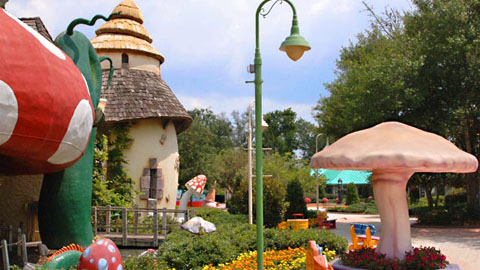 Large areas can be covered in a short period of time. 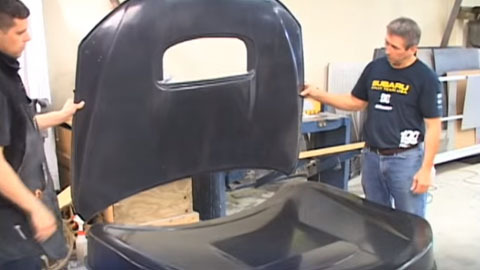 Plastic is impact resistant and can be sanded for priming and painting. 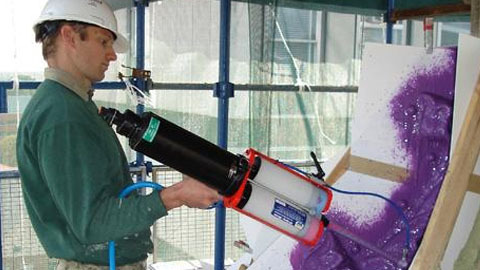 EZ~Spray® Foam cures quickly to a strong, lightweight and impact resistant 12lb. (approx.) 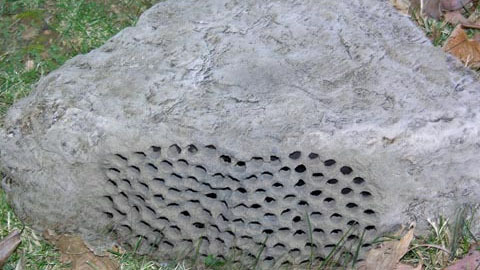 rigid foam. 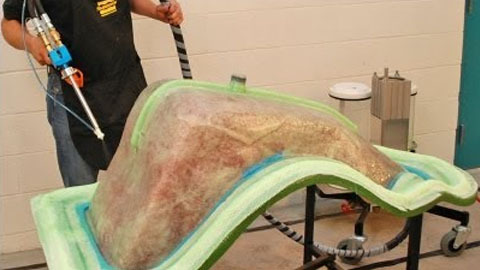 EZ~Spray® FlexFoam quickly cures to a solid, lightweight and durable 7 lb. (approx.) 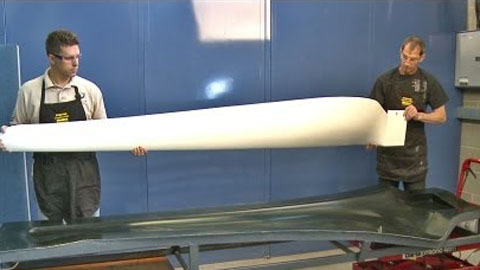 flexible foam. 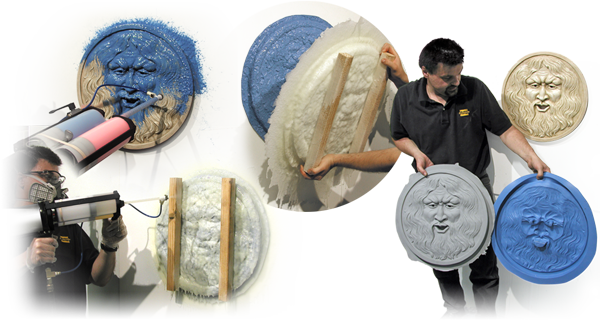 Both Can be painted and used for a variety of special effects and industrial applications. 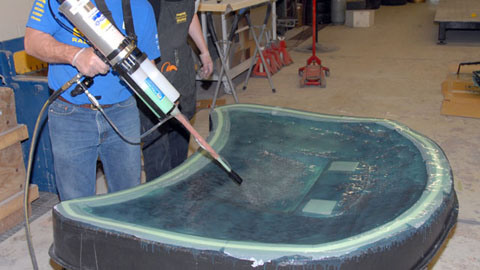 Using EZ-Spray Jr. to spray mold rubber and plastics to create large molds and lightweight castings. 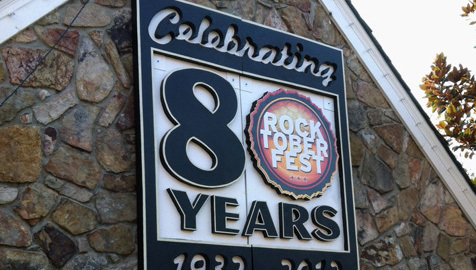 Rock City resident art specialist Matthew Dutton used Smooth-On's EZ-Spray Jr. Gun to apply EZ-Spray Styrocoat over carved styrofoam to create a sign that is 8 ft. x 6.5 ft. to commemorate being open for 80 years. 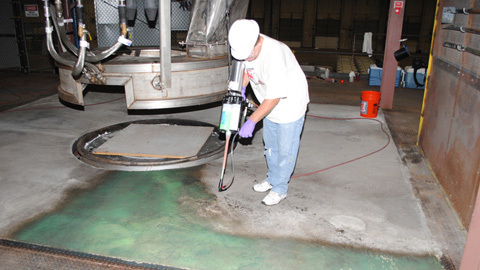 URBAN FOX STUDIO was recently contracted by a specialized manufacturing firm to apply a high-temperature resistant silicone rubber coating onto the surface of a refractory concrete floor.